The Wolf’s Symphony is a new screen print of the artwork that was originally created for the Jerry Garcia Symphonic shows in San Francisco this summer. 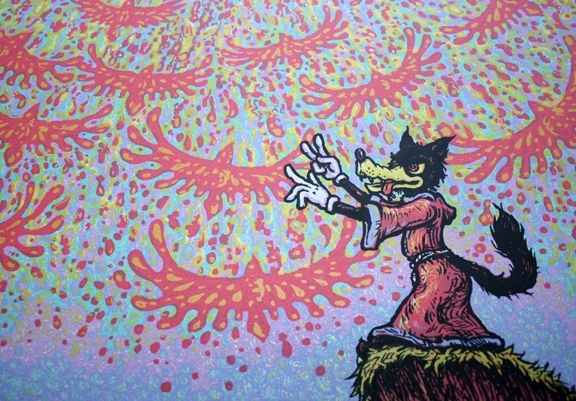 The wolf character in the image is representative of Jerry’s “Wolf” guitar that was played by Warren Haynes at these concerts. The original poster was 18″ x 24″ with an edition of 500 that sold out at the event. Since most people that weren’t at the SF shows were not able to obtain this artwork, we are now offering this smaller version of the art without the gig info. 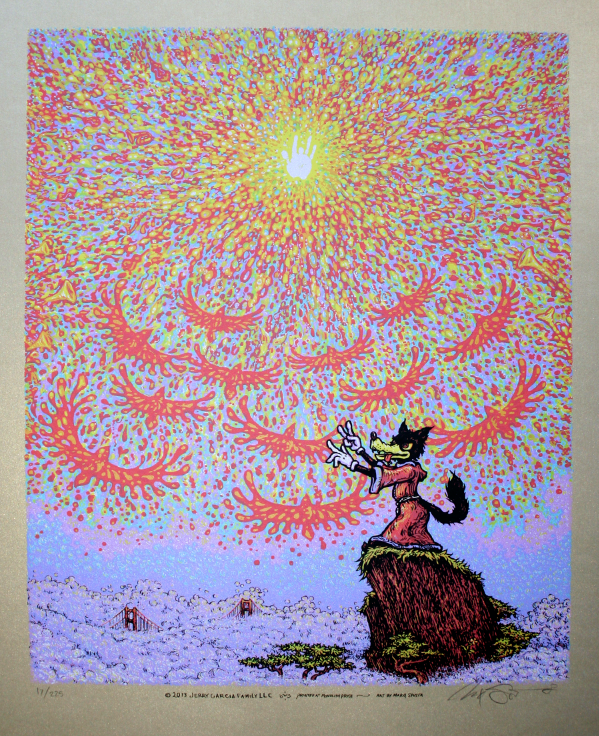 “Wolf’s Symphony”, 14″ x 18″ 6 color screen print on metallic gold paper. Signed and numbered edition of 225. Price will be $60 plus shipping. The Jerry Garcia Family will donate their share of the proceeds to the Rex Foundation. These prints will go on sale in the Spusta Shop on Mardi Gras (Tues. 3/4/14) sometime after 2pm pst. There will also be a few variants released, so stay tuned for those. Woo-hoo!!! bring on the march madness! Spusta!!!! Man you are bringing the heat bro. Lookin forward to it. YES!!!! Le Bon temps Roule! Thank you. Thank you. Thank you. And for a great cause too. Hopefully can pick one up Tuesday. Man I hope to get one of these. Love this print and hope I don’t get shut out yet again. 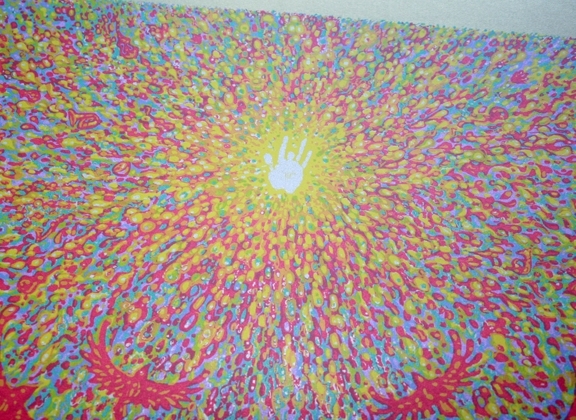 Awesome, such a great print., glad to see it a Art print also now. Awesome image, Marq! Love it as an art print. I heard there was a lotto for the variants. Is this true? I missed out on this drop. Less than 24 hours after these went on sale they are already listed on EBay for $175 and up, while people like myself got shut out and wanted one for personal use. Pretty messed up!! Will there be another drop this week? Maybe a couple of these left for those of us that missed out? Would love a real chance!! Thank you for your work! !